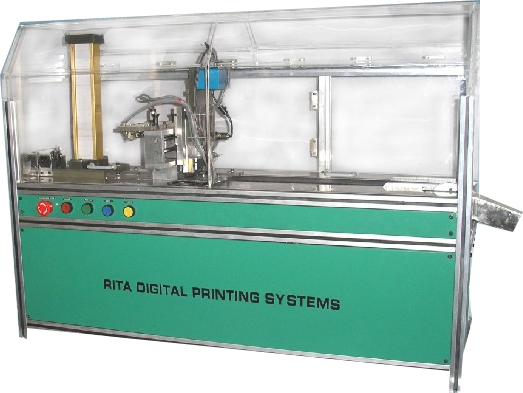 Rita Pad Printing Systems Ltd. is pleased to announce the introduction of the RDM-17S Digital Printing Machine. The RDM 17S Digital Printing Machine represents a new concept in the field of printing, marking and decorating of products utilising a Computer- to- Product technique by using Rita Pad Printing Systems proprietory developed Digital inkjet technology. Barcodes and Images with high resolution, precision and quality. Offline and Online automations for the Digital Printing Machine are available best suited as per customer's requirements. The Digital Pad Printing Machine enables you to maintain consistent high quality print at the most economical cost. The RDM-17S Digital Printing Machine is the right machine to print on Rigid PVC, Conduit pipes, Packing Straps, Caps, Bottles, Pouches, Laminates, Plastics, Tubes, Scales, Dials, Tetra Pack, Cartons, Labels etc. etc. If you require any clarification, please feel free to contact us. "Click here to Download Brochure"